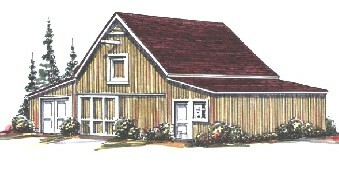 This 44'x24' barn has two parking bays and a big workshop. The shop has garage doors at back so you can drive your tractor or antique car right in. The main barn has 9' high and 10' wide doors front and back. Pull-down stairs and an outside hatch give access to a convenient storage Loft. The plans come with a variety of easy-to-build sheds that you can add across the back for more parking length or extra storage space.